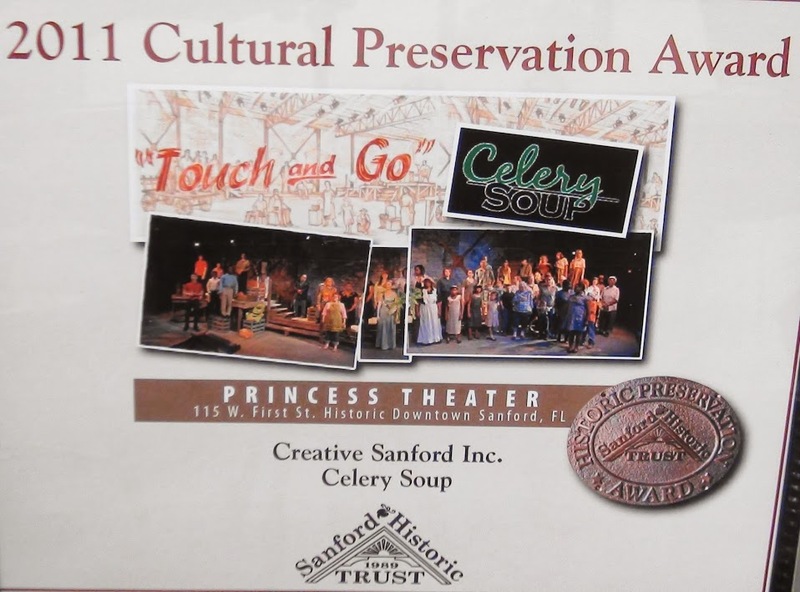 TheCultural Preservation Award presented by the Sanford Historic Trust to Creative Sanford, Inc. in 2011 for the play Touch and Go. The award contains images from the play and the address of the Princess Theater, where the play was performed. Creative Sanford, Inc. is a non-profit organization created to manage Celery Soup community theater productions. The original idea for the Celery Soup project came from Jeanine Taylor, the owner of a folk-art gallery on First Street in Sanford, Florida. Their first production was Touch and Go, a play focusing on the people of Sanford and their determination to overcome various obstacles, including the Freeze of 1894-1895, the fall of Sanford's celery industry, and the closing of Naval Air Station (NAS) Sanford in the 1960s. Richard Geer and Jules Corriere, partners from Community Performance International, were in charge of assessing oral histories, converting them into scenes for the play, and writing original songs. Director Geer also used an all-volunteer cast from the local community, many of whom were not experienced actors. In the process of producing the show, Creative Sanford decided to rehabilitate an historic building, the Princess Theater, which is located on 115 West First Street and owned by Stephen Tibstra. The Creative Sanford offices are housed in the Historic Sanford Welcome Center, located at 203 East First Street. Original 8.5 x 11 inch certificate, May 9, 2011: Sanford Historic Trust, Sanford, Florida: Creative Sanford, Inc., Historic Sanford Welcome Center, Sanford, Florida. Color digital image of original 8.5 x 11 inch certificate, May 9, 2011: Sanford Historic Trust, Sanford, Florida. Thompson, Trish. Interviewed by Autumn Reisz and Mark Miller at the office of Creative Sanford, Inc., Historic Sanford Welcome Center, Sanford, Florida. October 11, 2013. Audio/video record available. Originally created by the Sanford Historic Trust and owned by Creative Sanford, Inc. Copyright to the resource is held by Creative Sanford, Inc. and is provided here by RICHES of Central Florida for educational purposes only. "Sanford, Florida: How do you make Celery Soup? Add stories, then stirr." Community Performance International. http://www.communityperformanceinternational.org/sanford-florida. "Tales of Sanford's resilience are the stars of 'Touch and Go'." The Orlando Sentinel, October 20, 2010. http://articles.orlandosentinel.com/2010-10-20/entertainment/os-celery-soup-sanford-20101020_1_oral-histories-swamp-gravy-celery-soup. "Young dancer helps put spark in 'Touch and Go'." The Sanford Herald, March 2, 2011. http://mysanfordherald.com/view/full_story/12128828/article-Young-dancer-helps-put-spark-in--Touch-and-Go. Sanford Historic Trust. 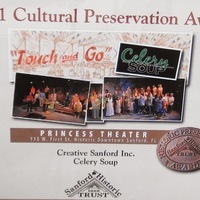 “Cultural Preservation Award for Creative Sanford, Inc. and Celery Soup.” RICHES of Central Florida accessed April 18, 2019, https://richesmi.cah.ucf.edu/omeka/items/show/3048.